For a brief moment we thought "Fat Ronaldo" had taken to track and field events after retirement. But no, it was just some chubby lad from American Samoa. Taking part in a heat for the 100 metres, Sogelau Tuvalu recorded a personal best time of 15.66secs - an extraordinary five seconds behind the winner of the race. We were even further taken aback when we heard this chap is only 17 and that he had trained for just a single month prior to the championships. 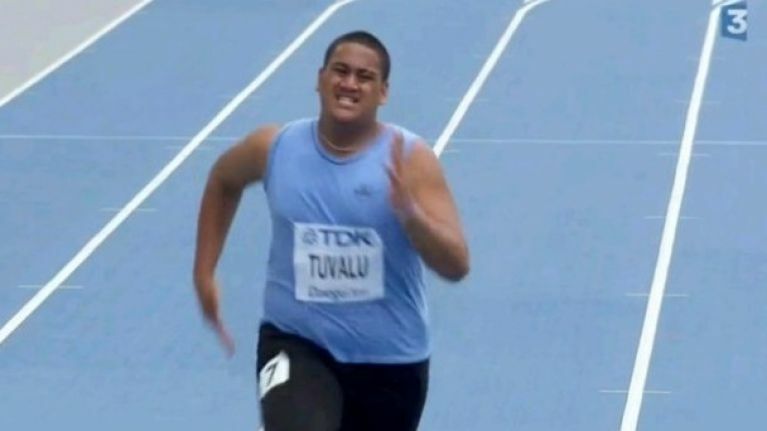 Having failed to qualify for the shot put event - which we're sure he would have excelled in compared to sprinting - Tuvalu followed his dream to represent his nation at a major sporting event. Despite losing face from the dismal run, Tuvalu was not one bit downhearted. "I believed in myself," he said after bursting himself. "This is a dream come true." Check out the "dream" run above. Think you could handle this 83km adventure race across Killarney?